Hold My Juice Box... I got this! We have improved our site! OK, let’s see… so far I’ve covered the west end, and the south end of Yellowstone. That leaves us with this the North and East side of the park. 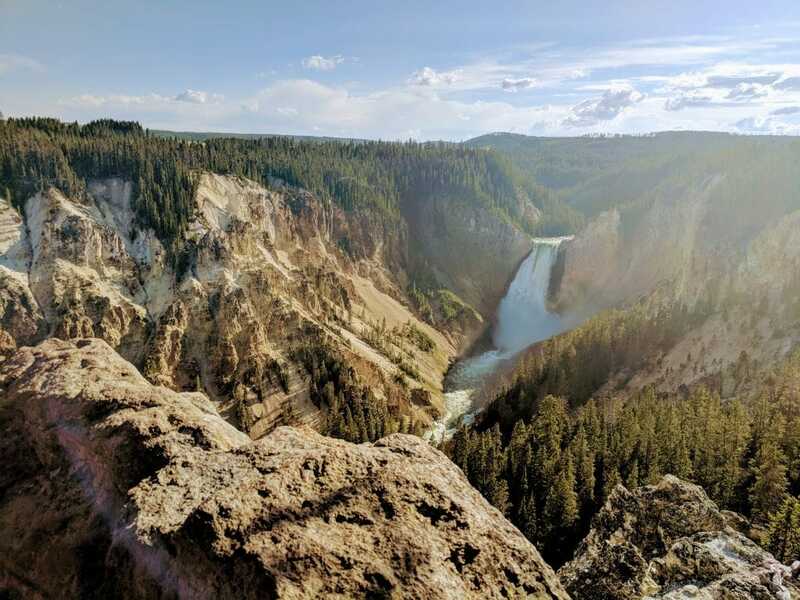 Let me tell you, the north side of Yellowstone is BREATHTAKING! There is so much to see and do here! That being said, if you do have extra time, I’d spend a whole day here! 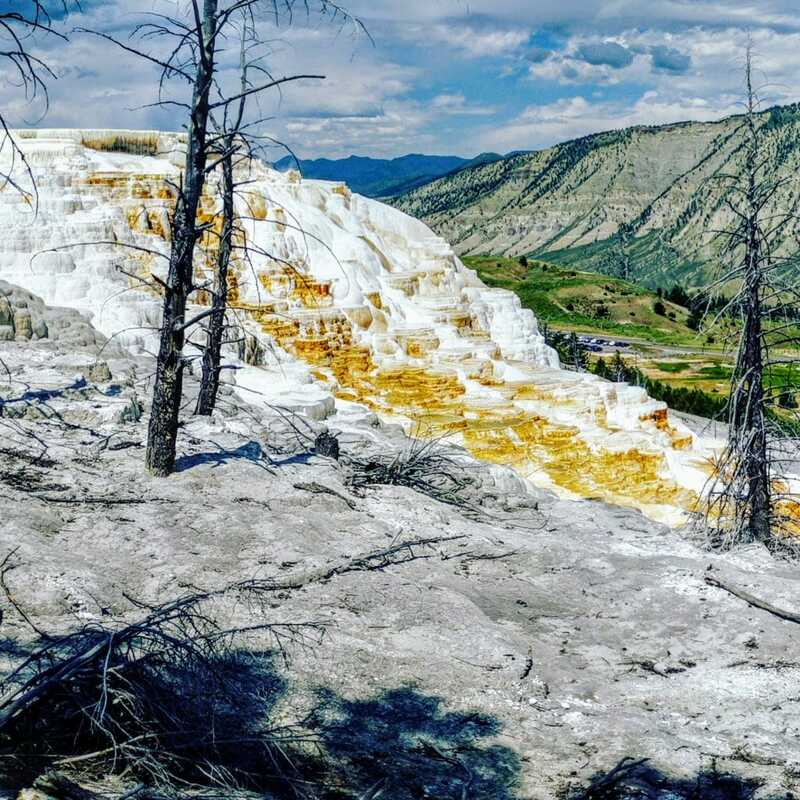 In this post, we’ll be looking at the famous Mammoth Hot springs, the Grand Canyon of Yellowstone, mud volcanos, basalt towers, and waterfalls! We came in from the east side of the park so our first stop was here at the mud volcano. The mud bubbled up and had an obnoxious odor (see the sour looking face on Alexa below). That rotten smell is from hydrogen sulfide and to me and many others it smells like rotten eggs. Alexa thought it smelled like hot dogs??? This area had a bit of an incline so if you are thinking about using a stroller check your energy level. Like most of our stops, it’s well worth it to see bubbling mud rise from the earth and experience the rotten smell (which is a fun experience for little kids). Sheepeater Cliff was where we chose to eat lunch. It was a fabulous spot that included picnic tables, bathrooms, and of course some climbing! We were all starving by the time we arrived for lunch so we quickly snagged the only open table and shared it among the whole family (all 16 of us!). When we were finished stuffing our faces we had plans to head to our next destination. Alexa, however, had other plans. 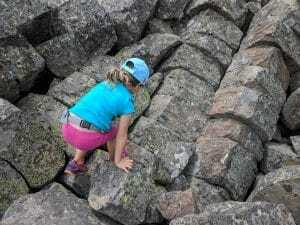 She had been eyeing up the older kids climbing the rocks, sitting on the lower towers and having their picture taken. So naturally, we had to do it too! The rocks were a lot harder to climb than I had anticipated or maybe it was harder because I had to help a 5 1/2 year old… Either way, she had a goal in mind and I literally couldn’t stop her. I was trying to be a helicopter mom but she was climbing so fast I couldn’t catch up to her! Once we made it to the column that she had her heart set on, I hoisted her up, took the picture and then realized we still had to get back down. That is always the hardest parts, right mommas? We climbed back down at the slowest speed with lots of doubtful comments from my once confident child. I had to be very reassuring that she would, in fact, make it down on her own and that I would NOT be carrying her down. I showed her the best technique to get down and pretended to be a pro at it, she bought it, and we both lived to talk about it! **pat myself on the back** Fake it ’til you make it, am I right ladies? The big win is she did it on her own, she had a goal, she had a challenge, and she fought past her own doubt! Talk about life lessons for all of us! This stop surprised me, first of all, I thought it was a pit stop. I thought it was one of those stops where you get out to stretch and take a quick. I must have missed the sign for this awesome place when my hubby, Scott, finally let me drive his new Tesla, or as we call it Frosty 2 or just Frosty. It was the first time I had driven this entire vacation, so maybe I was too excited and missed the sign?? None of that really matters, what matters is this views!! We hopped out of the car and headed down the wooden walkway. We hadn’t gone far before I saw what looked like plates of salt surrounding dead trees. If you didn’t see the beautiful green mountains in the background it would look like you were on another planet! Further down where the path comes to a dead end you will see the Mammoth Hot Springs. I know I have said this about most of Yellowstone, but, I just loved this area! I feel like each area of the park has something completely different to see. 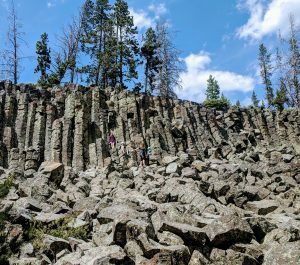 The whole northern loop of Yellowstone is a MUST see area for sure! Remember, don’t forget the GyPSy app! Check it out here! (I have no affiliation with GyPSy). The Hot Springs can be seen from the top (which is shown above) or seen from a parking lot below. The parking situation wasn’t terrible, at least when we arrived. This is a quick enough stop for most people to walk in and out in about 30 minutes. This short travel time I believe is what keeps the traffic low at this stop. Tower Falls is a short walk up a small hill behind the General Store. Let me tell you, this place was BUSY! It was a great stop to make to take a quick peek at the falls. I’m sure you could go on a longer hike, but the trail was blocked off when we were there. This stop was INCREDIBLE! There is a reason they call this the grand canyon of Yellowstone, the canyon floor is faaaaaar down! I felt dizzy just looking over the edge! 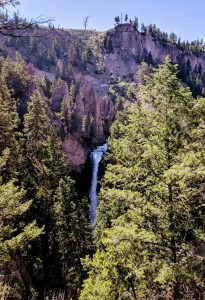 The waterfall was gorgeous, the walk was extremely short to the viewing area, and the rock wall that surrounded the viewing area was the perfect height for Alexa. I had to lift her to see the waterfall aka she couldn’t just hop up on the ledge and give me mini heart attacks. When our trip was over, I talked to my parents and I realized that I actually viewed the same place that my mom had visited before I ever existed. She had told me the story many times when I was younger about how she and my dad climbed through the woods in Yellowstone and had come upon the side of the “hill”. She said there were trees on the side of the hill and that she was overcome with paralyzing fear and so she clung to one of the trees and wouldn’t move. I had always imagined a much smaller “hill” and after seeing this I can’t imagine coming up to this after wandering in the woods where buffalo, elk, and moose roam! I’m really glad I was able to see this area for the beauty and to see the actual place that my mom and had roamed as teens! I hope you’ll get to explore this area and take full advantage of this incredible park for yourself! Also, look out for my post on the amazing cabins we stayed in (in Wapiti, WY) which will be coming soon! Subscribe to receive email updates! Catch all of the latest posts and news from Rockets and Tutus!